The bad news? There's probably nothing that you can do. Are you thinking, maybe, how to live with a hacker on your computer or ways to keep XP systems safe? Are you getting the dreaded blue screen, or ready to migrate to a new machine? Curious how multi-cores work? All that and more in this Answercast from Ask Leo! Could I just keep using XP for storing pictures and playing games? Limiting the use of an old XP machine could make it less vulnerable. Heck, you could just turn the computer off to keep it safe... but how useful is that going to be? Continue reading: Could I just keep using XP for storing pictures and playing games? Why is only one core on my multi-core processor being maxed out? You may have a multi-core processor, but not all software can utilize more than one core. Continue reading: Why is only one core on my multi-core processor being maxed out? How to I migrate to a new machine? Moving to a new operating system is rarely "seamless". But if you go about it step by step you'll end up with a stable system that will last for years. Continue reading: How to I migrate to a new machine? Should I take the security protection offered after the most recent security breach? Hackers are very good at sending emails that look like they come from legitimate companies. So, how do you tell the truth from a lie? Continue reading: Should I take the security protection offered after the most recent security breach? Continue reading: Could a hacked computer record my Skype video calls? What do I do about a bluescreen on shutdown? Blue screen on shutdown could be indicative of an issue with either hardware or software. We'll walk through some steps you can take to deduce the problem. Continue reading: What do I do about a bluescreen on shutdown? Can my company see my personal email? Should I cover my webcam when not in use? Can I just keep making incremental backups after I've made a full image backup? How can I get my lost Hotmail emails back? Does deleting things really delete things? Can my backup programs restore my settings to a new machine? I don't have installation media for Windows. What if I need it? As long as you have a valid installation key you can download a copy from Microsoft and burn your own disc from http://msft.digitalrivercontent.net/win/X17-24209.iso there is a tutorial on how at http://support.microsoft.com/kb/977640/en-us. I get this feedback a lot, there are two problems: 1) Only Windows 7 is legally, legitimately available for download like this, and 2) it's a retail, not OEM, version. In order to use it you must have a corresponding retail product key. How do I stop all this spam? One of three reasons I quit using Yahoo! and switched to Hotmail a year and a quarter ago was mainly because the e-mail address was being spammed. Now I know that it is kind of overboard to get a new e-mail address just because of a little spam, but my point is that the built-in Yahoo! spam filter blocking some less than 60% of spam was pathetic. Although I must be doing something right, because this e-mail I have had since December of 2012 (not 13) has not received spam yet. By the way, something in the Microsoft Security Intelligence report (volume 15, the most recent one as of this post): it mentions an increase of "Spam messages that include images and no text, which spammers sometimes send in an effort to evade detection by antispam software," from so-and-so time frame. Interesting way of Spamming, and I suppose that would be why legitimate e-mails with a simple picture (not as an attachment) but no text get. My experience? A full volume auto-play ad blew out my right speaker before I could kill the ad. The annoyance was second only to the physical damage to my right speaker. Yes, a true bummer. Leo, I've read that MSE will not be provided for XP after the EOL. Will it still be possible to obtain definition updates through the MSE program itself if it's already installed on XP? Another question, is using the offline definition updates available from Microsoft for 32 and 64 bit versions of XP, Vista and Win7 a workaround in case all else fails? Windows XP must die! Long live Windows XP! I want you to stop using Windows XP. It's time to move to a more modern – and more importantly, a supported – operating system. If you can't or won't stop using Windows XP, then I want it to work as well for you as it can for as long as it can. 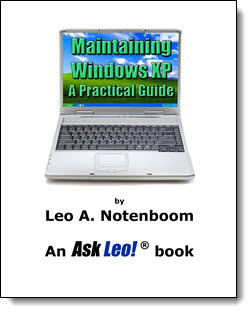 To that end, I've cut the price of the PDF version of Maintaining Windows XP ' A Practical Guide in half. Yes, I'm sending a mixed message, but I'm not alone; so is Microsoft, who recently extended the length of time their anti-malware tools would continue to be updated. This confusion in their messaging is driven as much by the people sticking with Windows XP as much as anything else. As much as we might love Windows XP, it's time to say goodbye. It really is. And no amount of complaining about what Microsoft should do, should have done, could do, or won't do will help or change that. They're going to do what they're going to do. Just like Windows 95, Windows 98, Windows NT, and Windows 2000 before it, Windows XP will very shortly be unsupported. The safest thing to do (and in my opinion, the right thing to do) is to move to another operating system. I'm not even saying that it needs to be a version of Windows. What matters is that the operating system is current and supported by its vendor and that it does whatever it is that you need it to do. Continue Reading: Windows XP must die! Long live Windows XP!